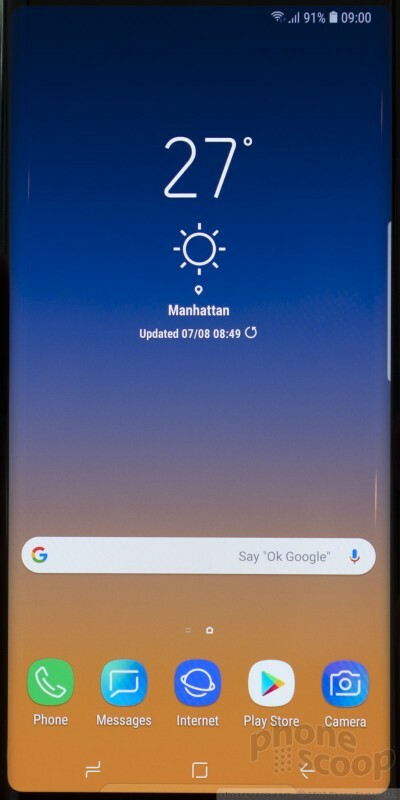 The Note9 is a variation on a theme. 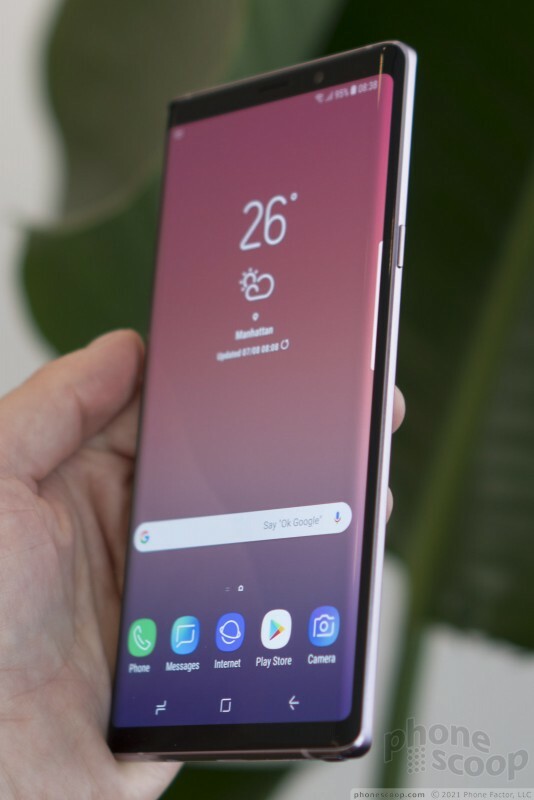 Where 2017 saw Samsung overhaul its Pen-toting Note to match the design of the S8/S8+, this year Samsung is making a few refinements and upgrades to the device rather than offering a wholly new phone. 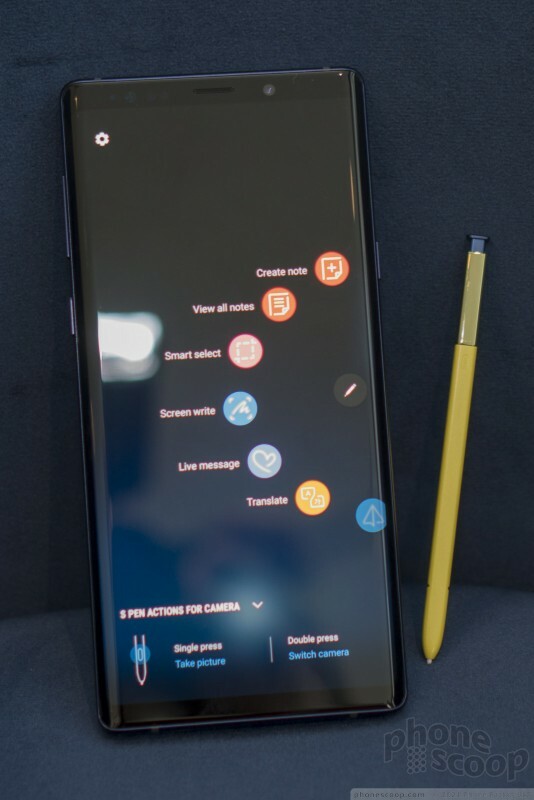 The Note9 is nearly identical in size and shape to the Note8. 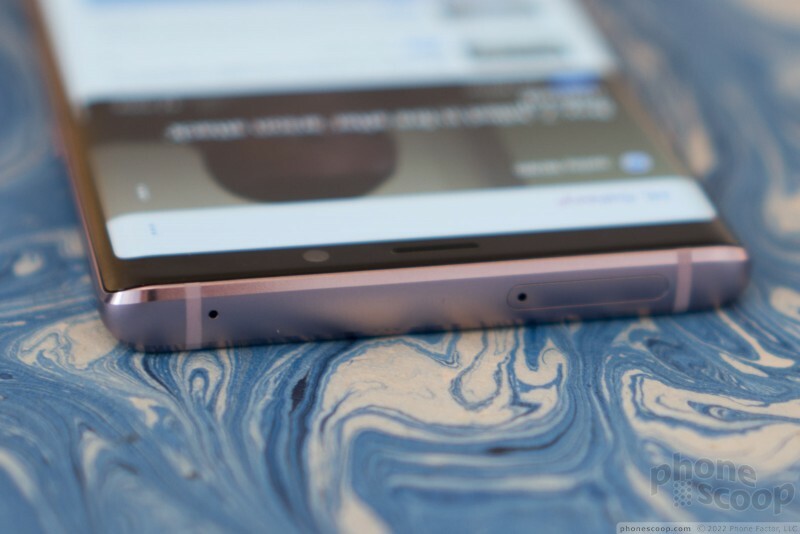 It features the same curved glass and metal frame in between with sharp-ish corners. 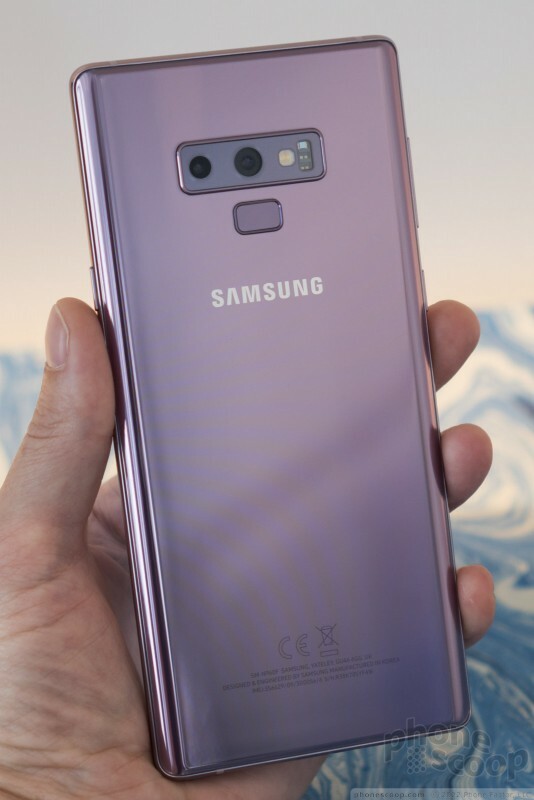 This year Samsung is going with just two colors: blue and lavender. Both look luscious at the right angle. 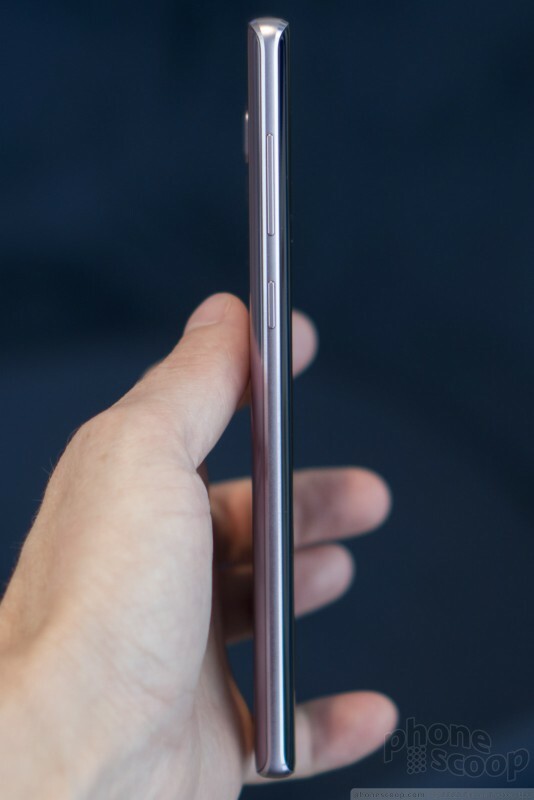 The Note9 is just a hair wider than the Note8 in order to accommodate the larger battery and bigger screen. Other than this minor change in dimensions, the two phones could easily be mistaken for one another. I like the chamfers on the metal frame, the bends of the glass, and the sleek profile. It is a huge piece of hardware. 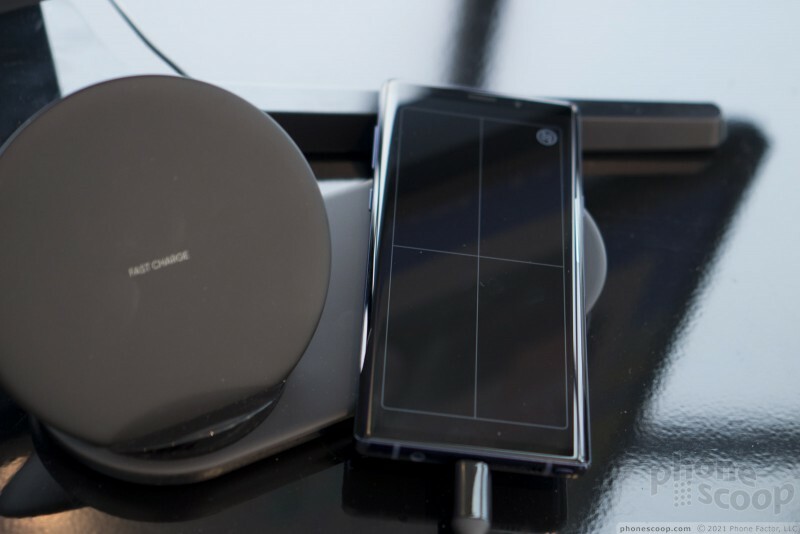 The Note9 stands tall at 6.37 inches and sits wide at 3 inches. There's no question that it is a two-handed device, and many people will find it is simply too darned large. 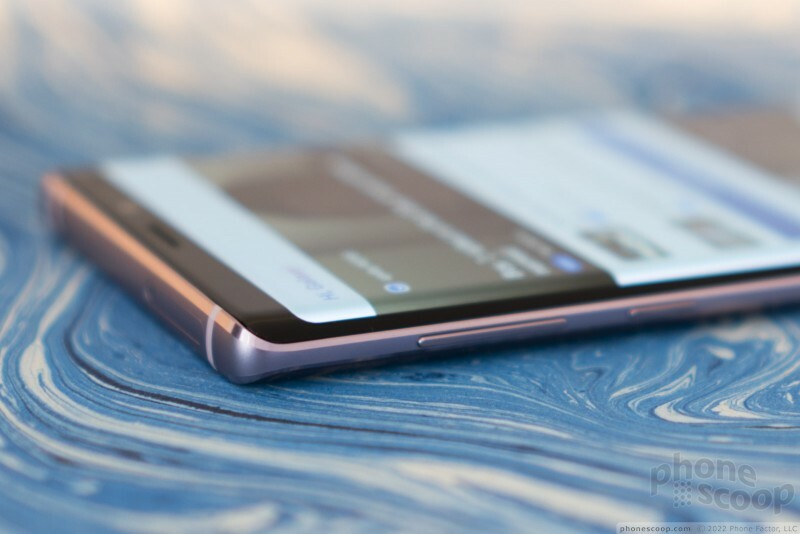 The narrower Note8 is easier to get a grip on. 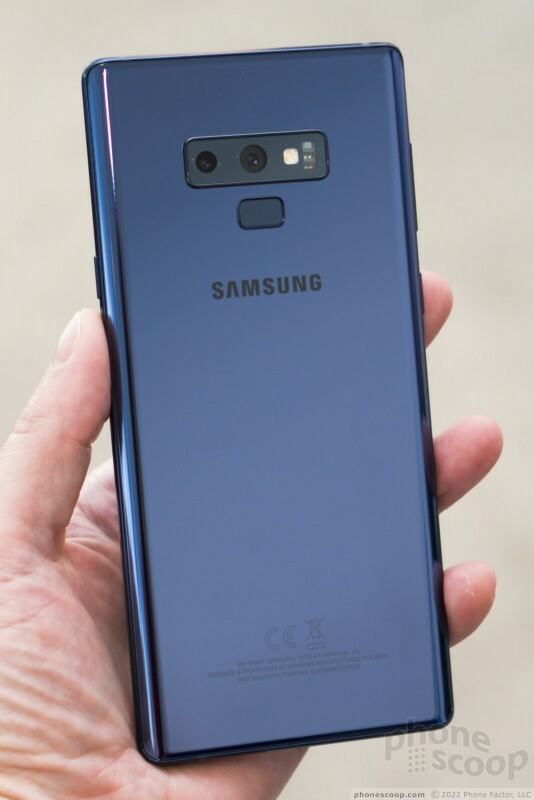 If it weren't for the 8.8mm thickness, the Note9 might not fit into pockets. The smooth glass easily slides against your jeans or cargo shorts, but those glass corners are poke-y when you sit down. The screen is eye-popping. At 6.4 inches, it is the largest Note display yet. It carries over Samsung's Super AMOLED technology and the ~2:1 aspect ratio with 2,960 by 1,440 pixels. That makes for a pixel density of 516ppi. It's hard to beat. The screen is insanely sharp, bright, and colorful. Samsung typically boosts colors for effect and that's evident in the sample units we saw. You can take control over the color tone if you want a more natural look. Other than the display, there's hardly anything on the front other than a slit for the earpiece speaker and a small dot that gives away the location of the user-facing camera. It has clean glass from top to bottom. There are no changes to the layout of buttons along the side edges. 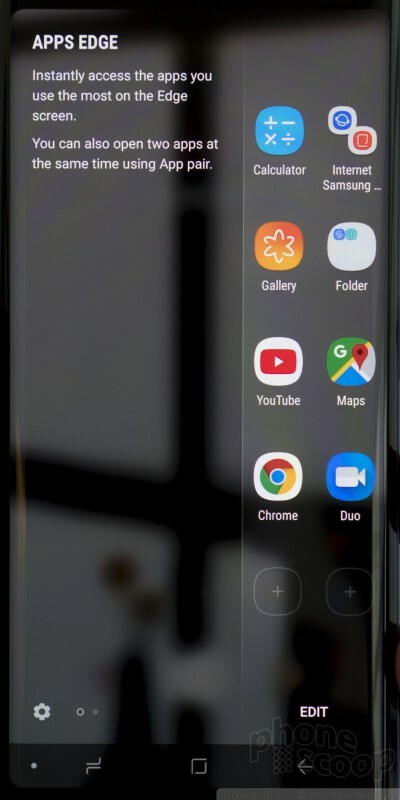 The screen lock button is on the right edge of the phone. It's the only button there and has a reasonably good profile. Travel and feedback are perfect. 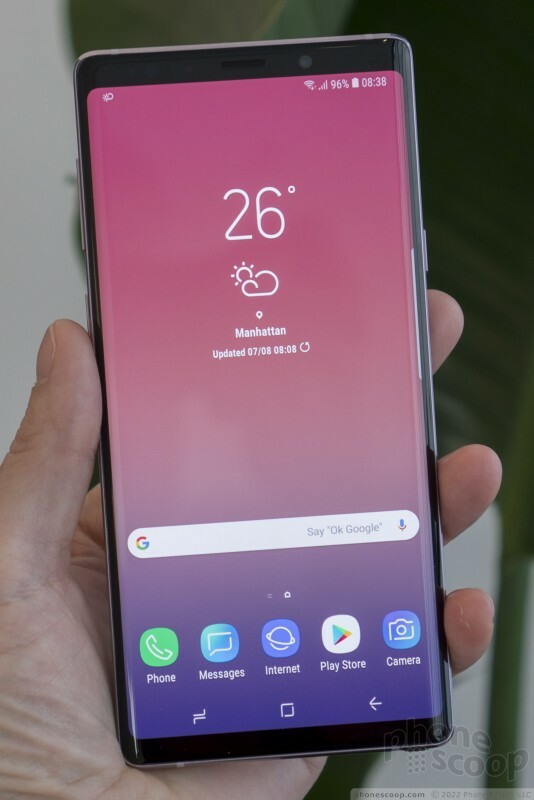 The dedicated Bixby button on the left side more or less mirrors the screen lock button in feel and feedback. The volume toggle is also on the left edge, very near the top. It can be a pain to reach sometimes. The SIM tray is tucked into the top edge, while the bottom holds the 3.5mm headphone jack and USB-C port. I'm digging Samsung's changes to the S Pen this year. First and foremost, the S Pen has color that contrasts that of the phone itself. The blue phone gets a cheery yellow S Pen while the lavender phone gets a purple S Pen. This is much better than the boring gray from previous generations. 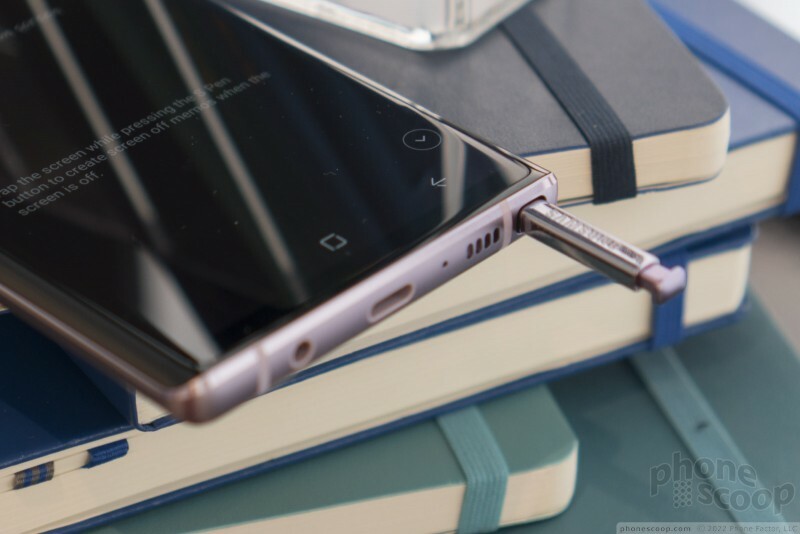 Press the end of the S Pen in and it will pop out a smidge. You can then pull it out the rest of the way quite easily. The Pen itself feels good; it's strong and light, if a bit short for my tastes. Samsung gave the S Pen new powers. It includes a Bluetooth radio and can be used to do some fun things. Be default, a long press of the button opens the camera. A second quick press will snap a shot. This is perfect when you've set the Note9 on a tripod or a rock and need to snap a family photo (with you in the picture!) The Pen interacts with a handful of apps, including PowerPoint, the video player, the music player, and others. Functionality is limited to jumping forward and backward, or pausing playback, but it can do far more than any other stylus I've seen. 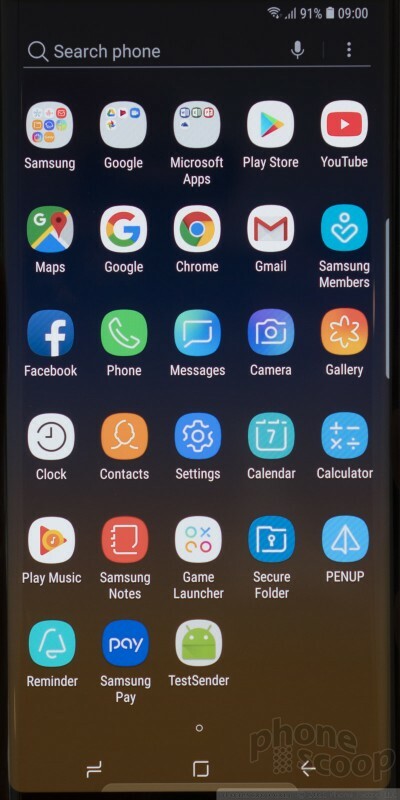 Samsung is making an SDK available to developers to target this feature. The software features for the S Pen don't appear to be all that different. The stylus lets you create GIFs, scribble notes, sketch pictures, and so on. 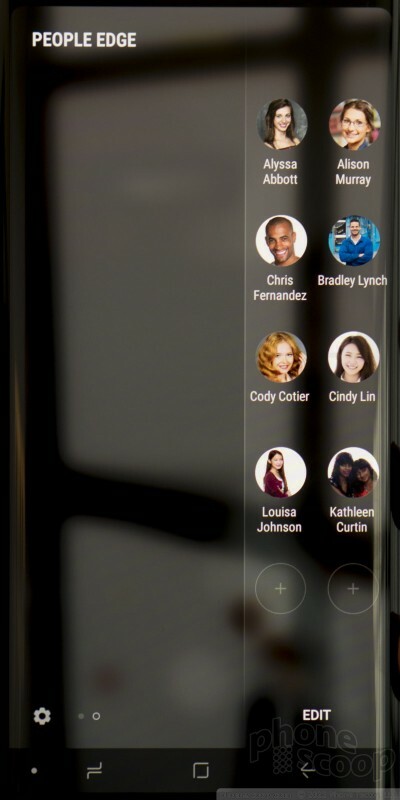 Samsung has heard your complaints about the fingerprint reader. 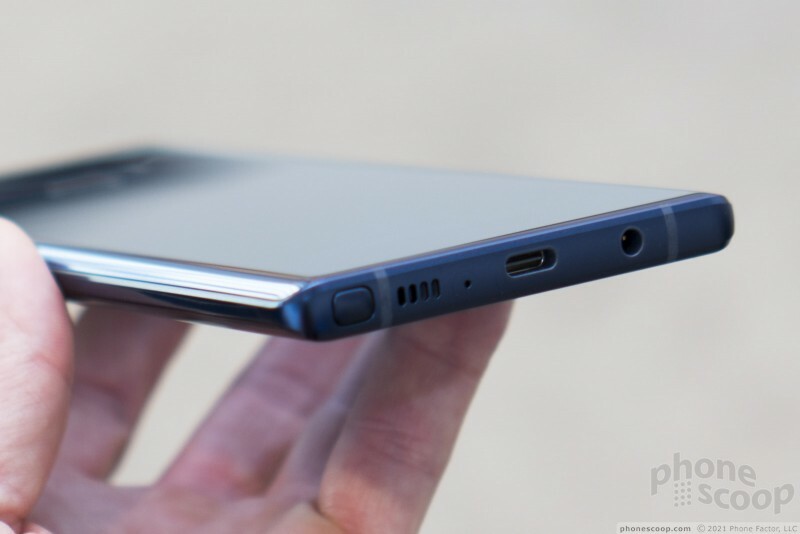 The Note 8 suffered from tragic placement of the reader, way up on the rear and over to the right. Now it is lower and in the middle, making it much easier to find and use. 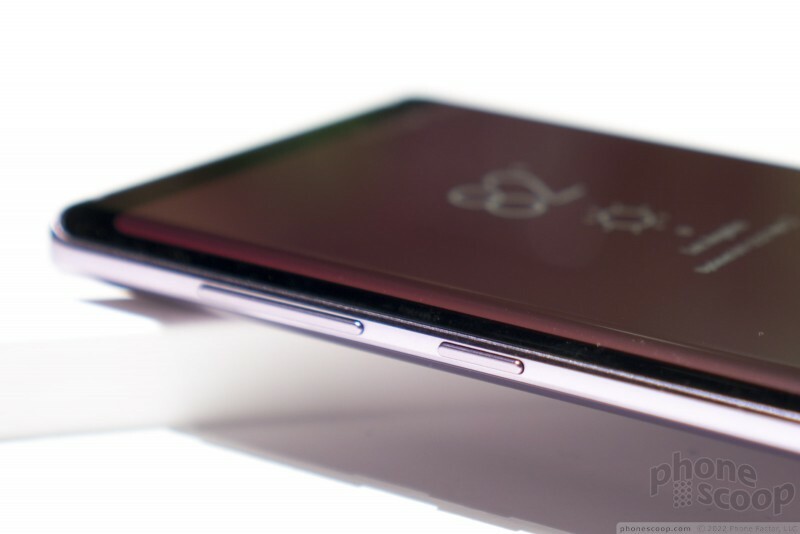 The camera module is set in a small glass cutout of its own above the fingerprint reader. The camera is largely carried over from the S9+, including the trick wide-aperture switch. Both the wide angle and 2x telephoto lenses have 12-megapixel sensors. The wide-angle has an aperture that can flip between f/1.5 and f/2.4, while the telephoto is set on f/2.4. The idea here is to be able to capture big scenes, but also zoom in. Together, the lenses can create portraits and of course the camera has Samsung's AR Emoji. Artificial intelligence is the big update to the camera. 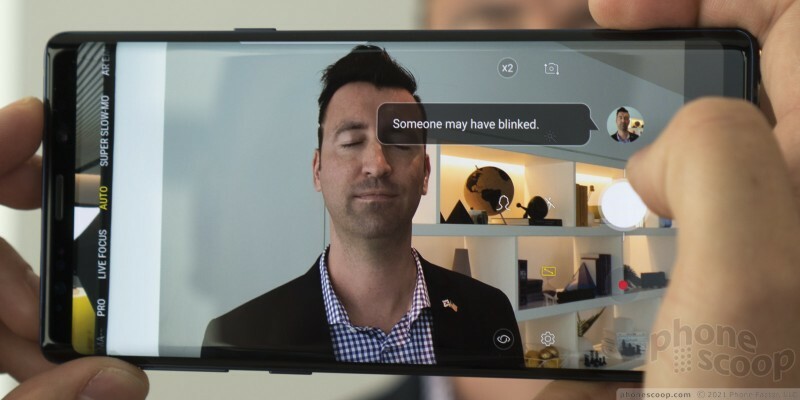 The Note9 is taking advantage of the machine learning added to the Snapdragon 845 to deliver automatic scene recognition. 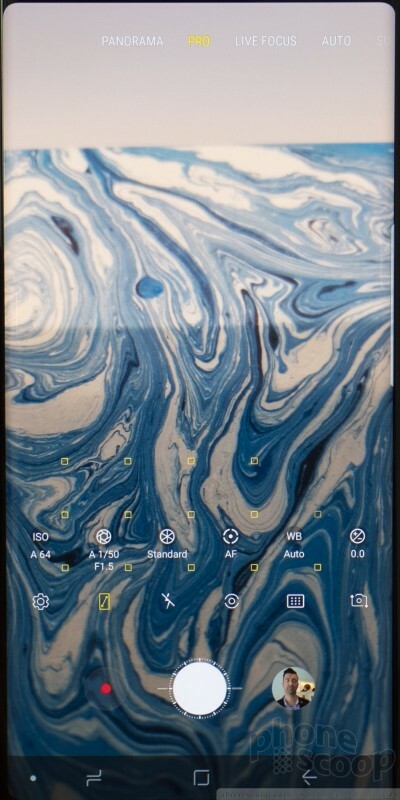 Similar to flagships from LG and Huawei, the Note 9 will be able to recognize a beach, sunset, or food, and adjust the color, aperture, exposure, and other parameters accordingly to get the best shot. 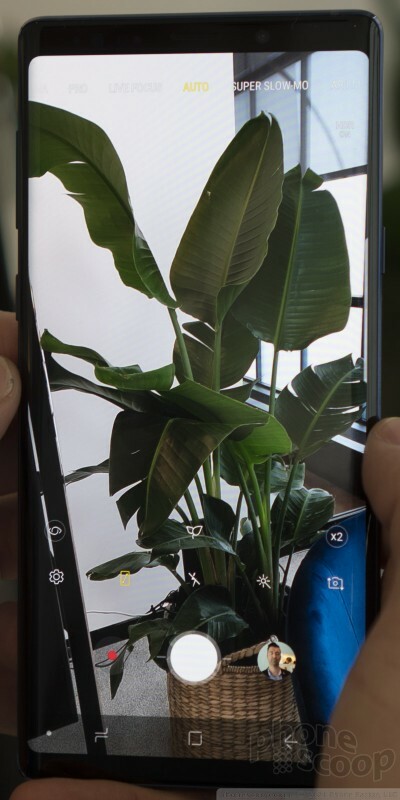 In the quick sample we saw, the Note9 correctly differentiated between flowers and plants. Neat. Samsung has tweaked the Snapdragon 845 to get more out of it. It updated the algorithm that controls the GPU and added a bigger heat sink so it can race the graphics at full tilt. 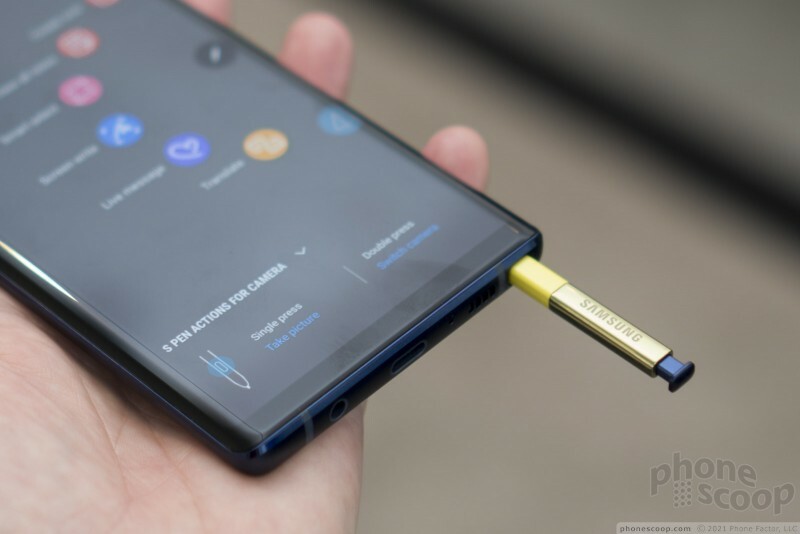 Samsung says games should fly on the Note9. The demos I saw looked excellent. A number of standard features are present, such as the IP68 rating for protection against water, a large battery, and a number of radios. The phone includes a Cat 18 modem with 4x4 MIMO, carrier aggregation, and LAA, which makes it the fastest available at the moment. Theoretical max download speeds can reach 1.2 Gbps. There's also Bluetooth 5.0 with aptX HD, dual-band WiFi, GPS, and NFC with Samsung Pay. 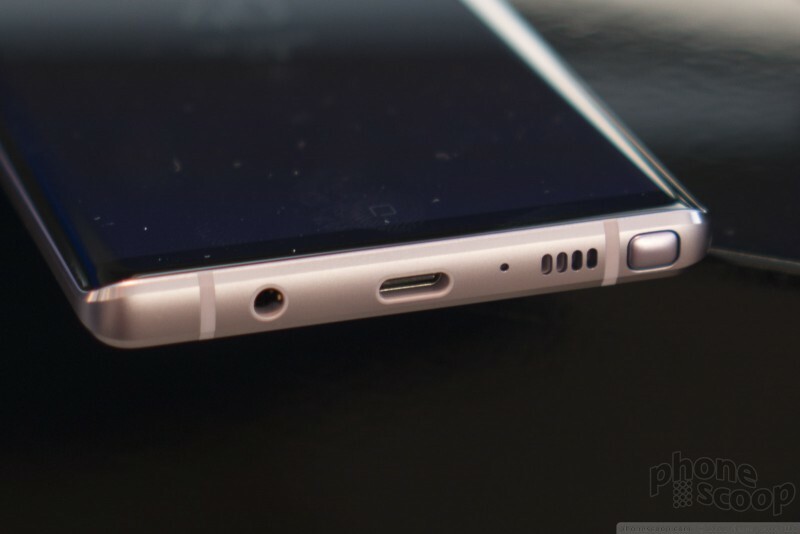 The phone has "stereo" speakers via the earpiece and speakerphone speaker on the bottom edge. Samsung says the speakers were tuned by AKG. The phone runs Android 8 Oreo out of the box. 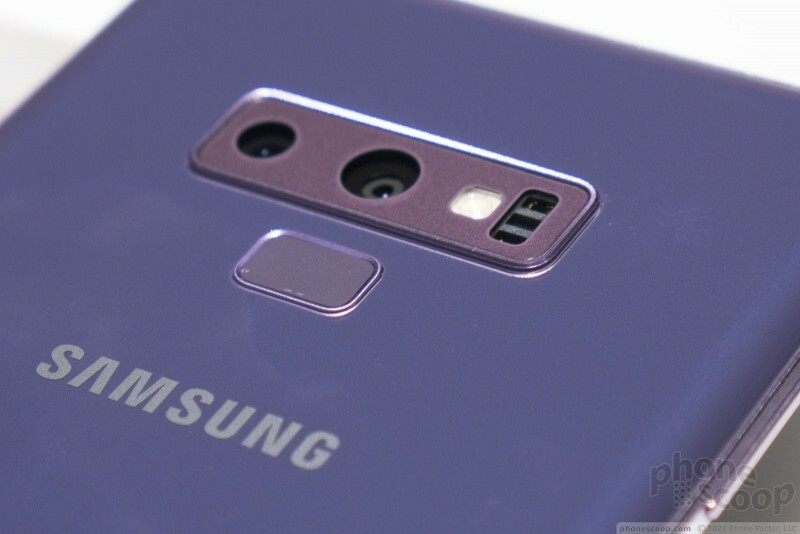 Samsung made no commitment to updating the Note9 to Android 9 Pie. 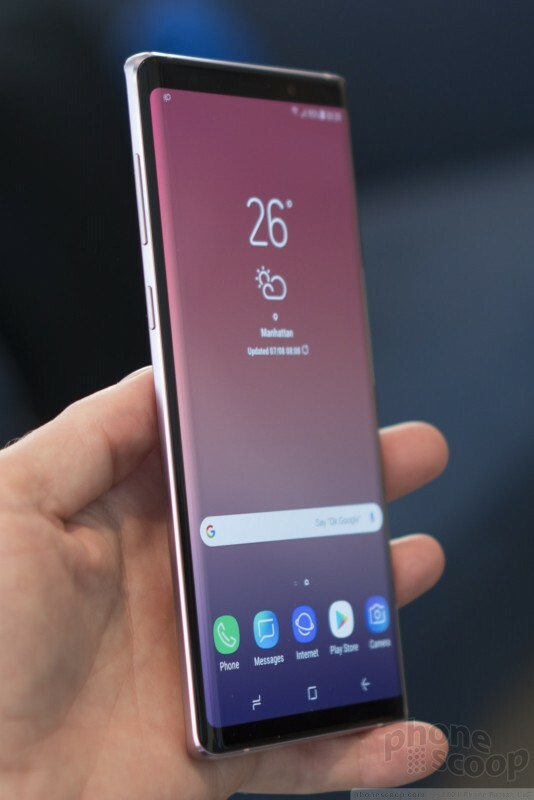 Samsung's user experience is carried over from the S9/S9+. 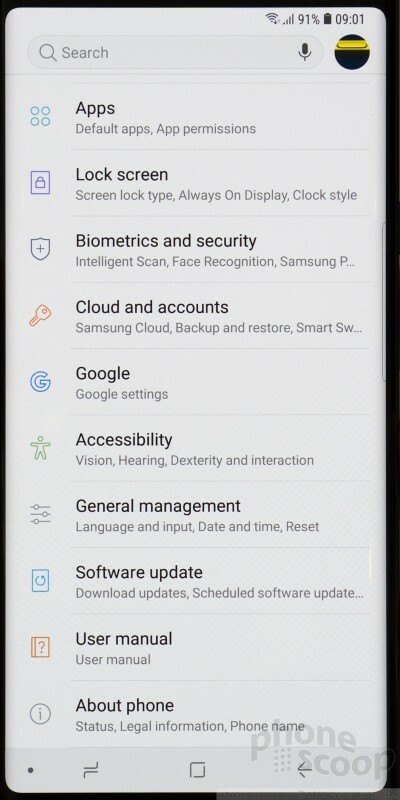 I like the slick look of the UI, but not annoyances such as Bixby and the convoluted settings menu. The demo units we saw all ran flawlessly. 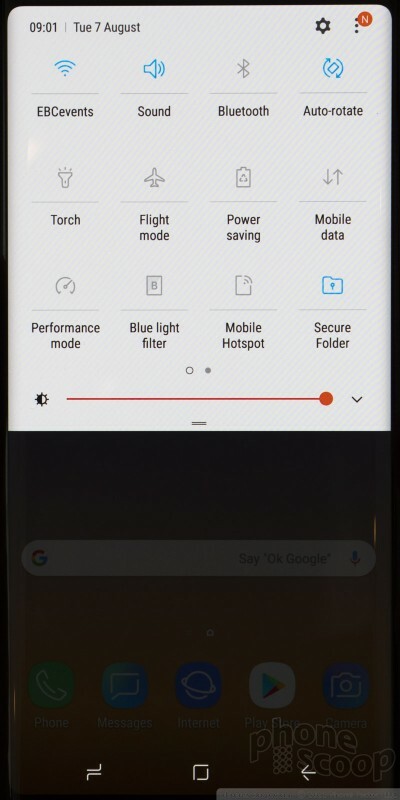 As with previous Note phones, the Note9 features Knox for security and DeX functionality to act like a PC. 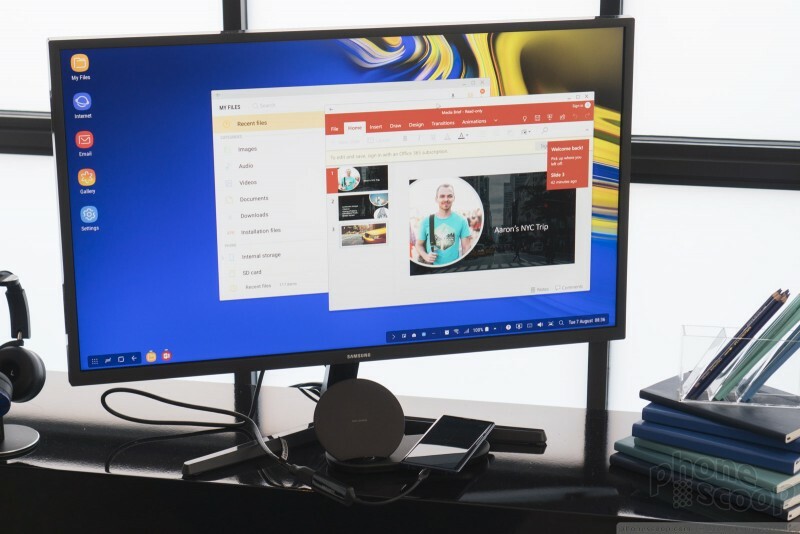 New this year, the Note9 won't need a dock to connect to a monitor. 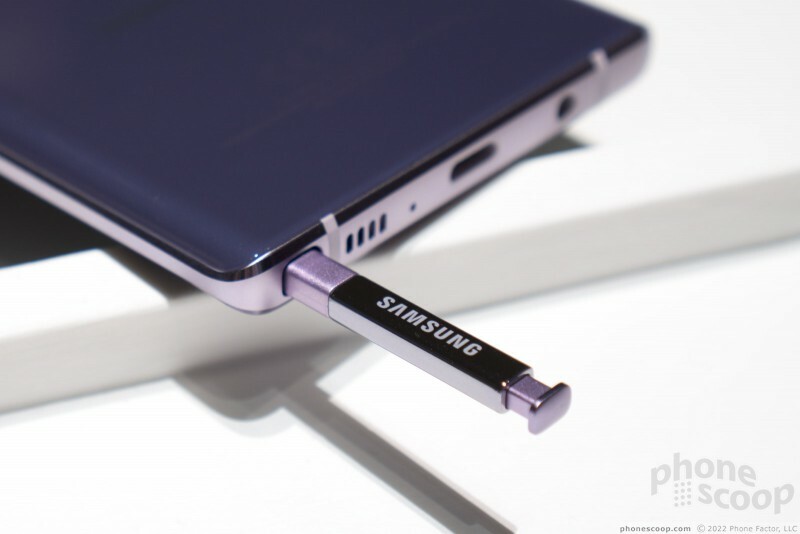 Note9 owners will need only a USB-C-to-HDMI adapter to connect to the screen of their choice. 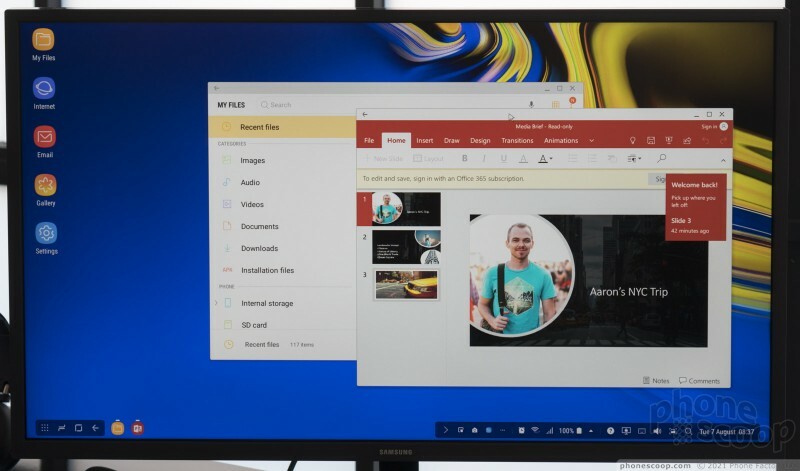 Once connected, the Note9 can display a PC-like desktop that includes access to apps and games. Moreover, people won't need a keyboard or mouse. The phone itself acts as both. (You can still use these accessories if you wish.) The demo stations showed just how powerful this tool can be. 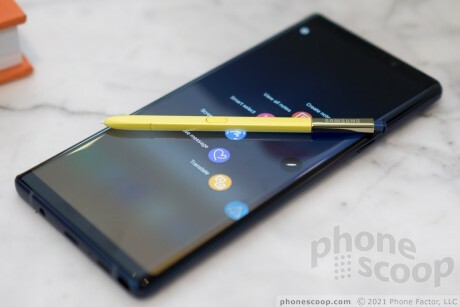 The Note9 will be sold in two memory/storage configurations: 6 GB / 128 GB for $999.99 or 8 GB / 512 GB for a wallet-crushing $1,249.99. It's a shame the 128 GB model doesn't have access to 8 GB of RAM. Both models support memory cards up to 2 TB. 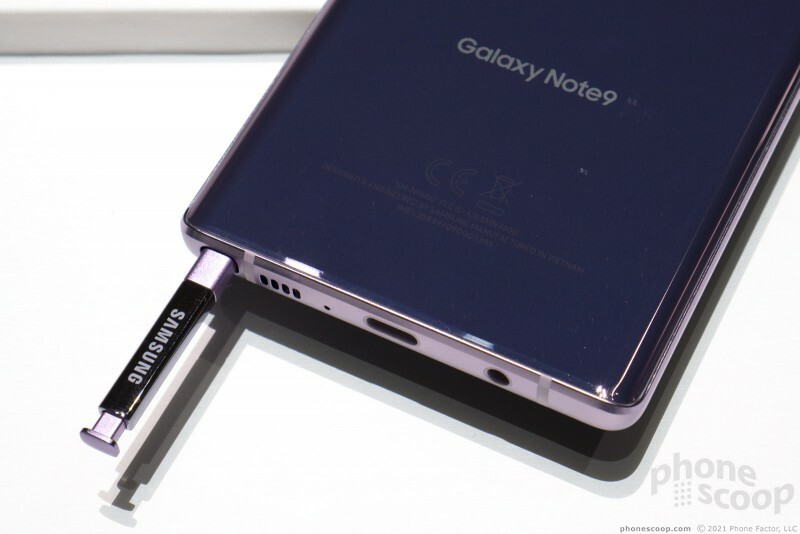 The Galaxy Note9 may not be entirely new, but I think there's enough under the hood to get enthusiasts excited. The bigger battery, bigger screen, faster/smarter processor, capable camera, and feature-rich S Pen will make power users stand up and take note. 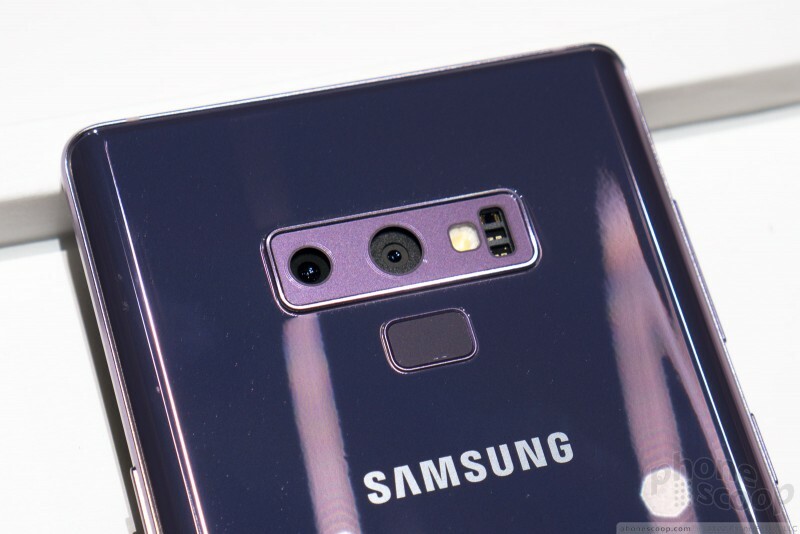 Samsung is pushing a small update to the Galaxy Note9 that introduces new options in the camera application. 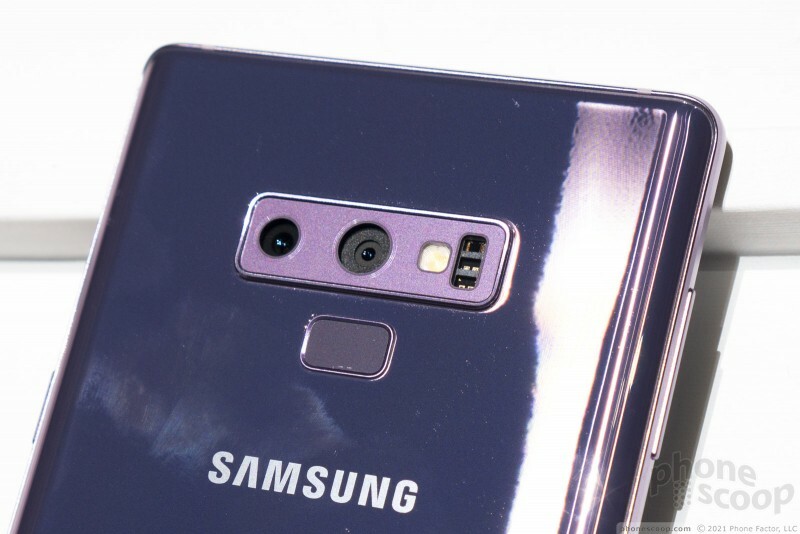 Before the update, the Note9 was limited to taking 0.2 seconds of 960fps slow-motion footage in manual mode.